Lisa did a good thing right before she died. She wrote a very simple card to me telling me she loved me and that I had done all that I could for her. She essentially said, “No guilt Danny. No guilt.” She told me to move forward in my life – to remarry. Her exact words were, “You’re not good by yourself.” Yeah. She knew. What a generous things for her to do. Selfless. Not surprising. I have no guilt. I have no angst about moving forward with my girlfriend, Julie. I don’t know if I would have without the final check off, mybe so. But it surely is nice not to question. In a way, those who know they are going to die have an advantage. If they choose, they can get their affairs straight. They can share how much they love their friends and family. They can help alleviate any feelings of guilt. They can plan with their loved ones. One would think that someone like me would fully be prepared to die. I’m not scared to die, sometimes it is actually more scary to live in this world than to ponder death. But I don’t think I’ve done a great job of planning for what could come. Do my kids know that I absolutely adore them? And not in a general sort of I love you way. Do they know why I love them, individually? Do they know what I think is most wonderful about each of them? At some point over the past year or two, my parents wrote a letter to me just to let me know they are proud of me. It’s framed in my bathroom (my favorite room in the house). Do those I work with understand their importance in my life? How they’ve stretched me and made me grow? Am I vocal enough with Julie about my feelings for her? Danny Tanner is not always easy to love. I come with a lot. I am thankful she’s in for the long haul. Have I thoughtfully thanked all those who stood by me in my darkest times? The ones who tossed my up on their shoulders and carried me when I couldn’t walk myself. Oh, they’ll get their reward in heaven, but wouldn’t it be nice if I took the time now to let them know that I haven’t forgotten – that I wouldn’t be where I am today without them. I hope I don’t die tomorrow. I am not prepared. They came home today. The two oldest, DJ and Stephanie, returned from ten weeks away working at summer camp. Not only did they come home, their clothes came home. 14 loads thus far – and counting. I’m used to the laundry. I kinda like it. It signals the end of summer and a return to normalcy. And yet, I am perplexed. Second, I unpacked Tide from both of their laundry bags. Yes. TIDE! As in Tide’s in, dirt’s out. How is it that my kids are using Tide and I am washing with Purex? 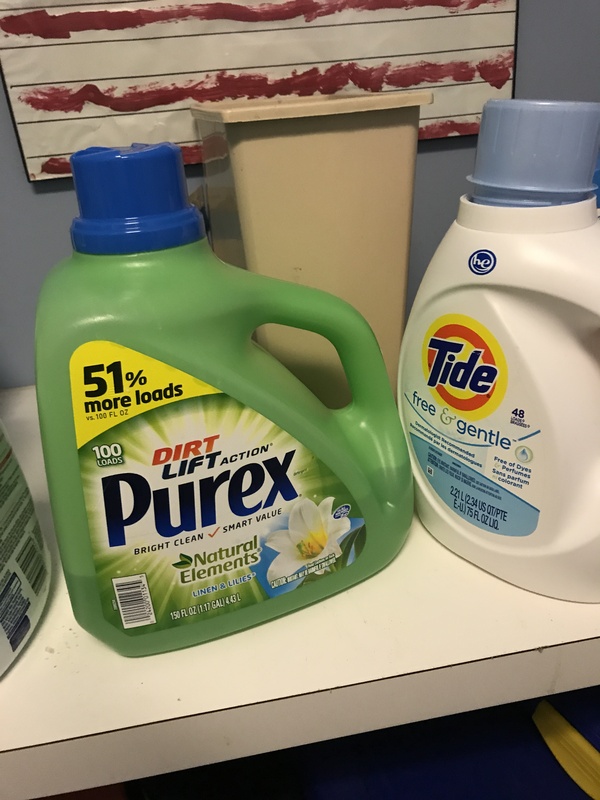 Not that there’s anything wrong with Purex, but man, would I like to smell like Tide when I walk down the halls at work. But no, my ongoing cost savings strategy requires that I settle for the least expensive suds on the shelf. And yet, my kids don’t! And the worst part of it is, they charge THEIR Tide to MY credit card!! I’m smelling like 13 cents a wash, and they’re walking around with a $.78 cent aroma. It does not make sense. The dad should be the one splurging. They are not even 21 years old. They don’t have steady employment. I fill up their cars with gas. I use generic toilet paper so I can afford their school tuition (and sometimes it hurts). But they are ordering sodas with their dinners (while I drink water), Ubering (while I walk), and washing their clothes with Top-Shelf detergent. I bet the college dorm room has Charmin! Geeze. I wish I was my child. I’d live a more lucrative life! They left me. Yep. All three of my girls trekked down to Camp Seafarer for a full five weeks. Today I pick up Michelle, and I am so, so happy. When Lisa died seven years ago, in addition to drowning in grief, I developed a fear of being alone. The thought of staying in our house without other human beings consumed me. I worked to stagger kid sleepovers so that all wouldn’t be gone at once. I did the same with overnight camp, picking one up before sending the next. I was paralyzed by the mere thought of quiet. When I turned 50, I assumed I was complete. I am happy, understand my strengths and limitations and am comfortable with who I have become. What I didn’t expect was more self-growth. I thought my insides were pretty set – sort of like the gray hair – there was no reversing what had developed; it is what it is. What I have discovered over the past month is that, even as an aging dude, I’m ever changing, ever growing, ever maturing. Yeah, I have REALLY missed my kids over the past 36 days (not that I was counting) but this time apart has allotted me time to rejuvenate and to focus on areas of my life that I’ve somewhat neglected. This past month I’ve been able to focus on my relationship with my girlfriend, Julie. she doesn’t live in Raleigh so the ability to head to Charlotte or on vacation together has given us the chance to pull back the curtain a bit. I’ve discovered she’s cooler than I had imagined. And best of all, after getting to know me even more, she’s still taking my calls! I’ve exercised, slept hard, read and watched my backlog of DVR’d CBS Sunday Morning shows (man am I old). I’ve eaten dinner with a number of my buddies, visited my parents twice, and I even got a massage. I’ve surprised myself this year. Even at AARP age, there’s still hope to tweak my many imperfections and to face down my fears. It isn’t over! I have a long way to go, but it’s nice to know it’s not too late for improvement. I raise money for a living. I work at a large YMCA in the development office. Currently we are working on a $117,000,000 campaign which will allows us to build five new YMCAs, renovate several existing Ys and camps, send tens of thousands of children to programs who otherwise could not afford to attend and grow our endowment. Most people don’t like to ask folks for money. I got over that about a decade ago. I just really believe in the work that we do. I often drive prospective donors around in my car to take them to programs or show them construction sites. I drive a 2007 Acura MDX. It’s a nice car that I’ve kept well maintained. But it is old. Each time I have an appointment, I try to remember to tidy up my vehicle wanting to make a good impression. Recently, I pulled up to our downtown Y facility to pick up a couple I had never met. They were older, a bit reserved. I had forgotten to tidy. I opened the car door for the wife and as she climbed in the back of my car, I noticed a number of tampons, in very colorful wrapping, dispersed across the seat and floor. I dived in before her explaining my situation: “I am a widower and have three teenage daughters…” who apparently want me to get fired! It used to be Cherrios I’d find strewn about my vehicle. My how times change. I don’t get this. Do they just grab a handful and dash out of the house as if they’re taking mints from the checkout counter at Denny’s? What good are they to them in the car floor? Why not in a backpack or purse? Why are they packaged in the most vivid colors available? Neon green, yellow and pink. You can’t miss them. They glow in the dark. On more than one occasion, I’ve been asked to hold a stash in my pocket at an event. I’ve reached for my keys before and had a tampon explosion – dropping them on the floor and having to scurry around to clean up my mess. At least they’re easy to find. I wish women had pockets. I wish cars had built in hygiene storage compartments. I wish tampons came in plain, gray packages. A dear friend of mine just resigned from the YMCA where we have worked together for thirty years. She got an awesome opportunity to work with a former co-worker at the Y in Richmond. Her kids are both in college, and it just seemed like a great opportunity for her to start anew. She basically lived in Raleigh her entire life and most of her career, although in different positions, has been in one organization. Gutsy move. I recently went through a significant one with Michelle on high school choice. That one was not mine to make, but I did hold some responsibility for coaching. Stephanie is beginning to ponder colleges. Another biggie. Where you go to college will set the compass for the rest of your life: where you live, your future spouse, your kids – all of those things ride on ONE significant decision. Through the years, I’ve had opportunities to apply for other jobs similar to my friend. I’ve considered selling my house and downsizing. Occasionally I get the bug to pick up and leave the comfort of Raleigh, where I’ve spent the past 33 years, just to try something new. But my roots are so very deep. I have another friend who has had job after job. She has lived in at least four cities in North Carolina, in Minnesota, and Colorado. She has gone to various higher education institutions to chase her dreams. And, she has always made new friends and adapted well. I once saw a movie called Sliding Door. The movie highlights Helen’s life. She gets fired from her job and heads to the subway for home. In one scenario, she catches the train and finds her boyfriend cheating on her in their apartment. In another scenario, she misses the train and has no idea what he did. The movie follows these two parallel lives. And the outcome at the end is remarkably different, simply because of one train ride. I suppose the lesson here is that any decision we make, big or small, can drastically change the course of our lives. Lisa’s sister met her husband at a bar one night years ago. Had she stayed at home to watch Grey’s Anatomy, who knows? She simply felt it was the right thing to do at the right time. Although I’m not happy with her for leaving, I’m pretty sure she’s made the right decision. A little prayer and the following of your “gut” can lead you to some pretty incredible things. The night ends with boo – hoo. she wrote hard for the first. Oh Lord, we’ll be cursed. was even too late for some cheating. Although late, I was on it! Putting it together was not. Michelle was up really late. And me, well I watched. from the hole punch til I thought I would die. to learn from Mr. Nowak. And taught them Shakespearean clack. We bought our house in 1994, about 7 months after we got married. It was built in 1955 and had, for the most part, been updated since. After we moved in, my grandmother gave us $1,000 to help with home improvements. 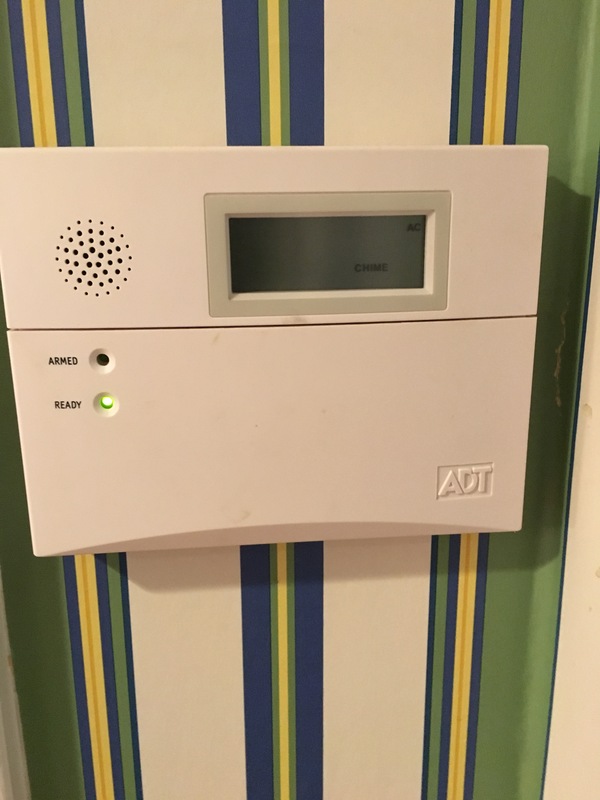 My mom strongly suggested we immediately invest in a home alarm system, because she thinks that most criminals are aggressively targeting our family at all times. I pondered my options – toilets that would flush or alarm; air conditioner that would pump out cool air or alarm. Because of the intense crime rate in my neighborhood in the heart of North Carolina, I went with alarm. I have been pleased with it over the past 20 years. It does give me comfort, most of the time. Last Wednesday night, it did not. It went off at 3:23 AM and scared the &%$# out of me. It blared for about 15 seconds, went off, and then blared again. How odd. I had forgotten how dark it is at 3:23 in the morning. Like, imagine being blindfolded in the closet under your mother’s long dresses. That’s how dark it is. I lay in the bed for a minute or two listening for the guys who were about to murder me. Sadly, I didn’t really think about Stephanie who was alone, upstairs, in her bedroom. These were clearly quiet burglars, perhaps in socks. I couldn’t hear a peep. I remembered Lisa sharing stories of her father slowly climbing the stairs of their home when she was a kid about ready for bed. She would call out, “Dad, I know you’re there!” She said it felt like hours before he would jump into her room for a surprise tickle attack. I waited with the same anticipation. I finally mustered the courage to walk to the kitchen. I looked around my room for weapons that could assist in my defense. I had a lamp that could have acted as a tire iron for whooping up on the enemy, but damn, it was a lot of trouble to unplug. The biggest book on my nightstand was Josephus Daniels, his Life & Times. I’ve been trying to read the 600 pager for three months to no avail. Perhaps this would make good use of my investment. I had a hand bell that the kids used when they were young to get my attention when they were at home, sick in bed. Perhaps I could stun his hearing, confusing him while I grabbed my child and ran out the front door. Finally, I decided I’d rely on my massive strength. I have been working out for years. Although I’ve never punched anyone before, there was certainly pent up force in my massive arms. I called the alarm company asking if they had received a signal. They had not. I asked the lady on the phone if she would come over and sleep with me. That apparently is not included in my annual contract. “How much would it cost to add that service,” I inquired. She didn’t even sound attractive. People are less fun in the middle of the night. I considered taking a large butcher knife with serrated edges back to bed with me but decided the likelihood of me actually having the guts to stab someone, regardless of the situation, was less likely than me rolling over and accidentally cutting out my own spleen. As I nestled back into my Serta, I remembered I had a child upstairs. That was a long way from my bedroom, and I would have to go through several dark rooms to check on her. Certainly she was alright. My parental guilt sank in – I knew I wouldn’t be able to sleep if I didn’t make sure she was OK. I grabbed Josephus and put my bedroom shoes back on. When I got to her room, she was sitting up in bed. She had her phone in her hand and her covers pulled up to her chin. As humans, we act as if a layer of cotton is a force field that can protect us from anything. So, there is a mad killer potentially on the loose in our house, our alarm goes off, twice. She hears me stirring in the kitchen and notices that lights are on. And… she pulls up her covers and checks Instagram. I guess it would be nice to know if you got 100 likes on the last picture you posted before you are bludgeoned to death. OH. More likes than Sarah Kate! I’m ready to die. It is scary to me that my children think I have it ALL taken care of. They put a lot of confidence in this aging, 175-pound, powerhouse of a man. I’m like the Daddy Secret Service. If they only knew: I AM PETRIFIED, most of the time, on many, many levels. DJ has returned! The eldest, the heir to the throne, is home. A friend who has a son who is a junior in college told me to get ready. He said his wife was recently walking around the house with a basket full of toilet paper rolls. I was ready. I counted my rolls. I don’t think DJ is a Charmin swindler. When she left we still had a nice stash. She has, however, left every garment she brought back to the State of North Carolina in my den. Shoes on the kitchen bar stools, coats, and there were several, on the floor by the back door, a bra in the bathroom. Within 24 hours her bedroom looked like it had been hit by a category 4 storm. Just like high school! How does this child live in a 13’ x 13’ room with three other people? On Tuesday she told me that I could expect my credit card bill to be a bit higher this month. We have eaten at her favorite restaurants, watched her favorite movies On Demand, cooked the meals she likes the best and shopped for clothes that she desperately has to have. Apparently the last four pairs I purchased for the four high school winter formals just won’t do even though her foot stopped growing in eighth grade. Frankly, I don’t know how she has survived this long without the critical articles of clothing we purchased this week. Bless her heart. On Thanksgiving Day, it became grossly apparent to me how children fall back into their high school behaviors as my 78 year old parents worked their butts off in the kitchen while my brother sat in the den watching TV. The gall. Oh, and he wouldn’t even pass me the remote! I’m about to finish my second term as an elder at my church. The first time around I didn’t take advantage of one of the main privileges of serving. This time, with a little twist of the arm, I discovered one of the most rewarding parts of being a leader at First Presbyterian: Home-bound Communion. Two elders get The Body of Christ “to go.” It’s in a little leather box. We meet in the church parking lot at 2:00 and head out to some elderly person’s house. You never know exactly what you’re going to find. This past week, my partner and I made two stops. The first was at the home of an older gentleman who had worked for the City of Raleigh for many years. I was warned that he sometimes doesn’t wear all of his clothes. Me neither; no big deal. We actually had to crack his front door and yell out to get his attention. He was appropriately dressed but confined to a wheelchair, living in his wooden ranch alone. His wife died many years ago. We swapped war stories. We laughed that they would be up there waiting for us at heaven’s door with a great big To Do list. After chatting, we pulled out the bread and juice. We had fancy, tiny, silver trays for serving, but we could have used a Dixie cup. The scripture, prayer and act of breaking bread, knowing the symbolism, was what was important. We then hit a nursing home for dementia patients. I’ll have to admit it was a bit disturbing to walk in. The door shut and locked behind us. We couldn’t get out on our own accord. I felt a bit claustrophobic. We walked down the hall to room 125 where we met two beautiful women. One was from our church, the other was her roommate, an Episcopal. They argued a bit about whether the different denominations could take communion together. They played off of each other well, seemingly enjoying each other’s company. Sparring a bit seemed natural for them. One asked me how old I was. When I told her 49, she said I had preserved myself well. They asked about our families and were interested in our kids. One asked if I was dating. I don’t think she was fishing for herself! She was just genuinely concerned about my happiness. She had buried two husbands, one when she still had four kids in the house. We had a lot in common. You’d think it would be them who received the blessing that day. Certainly having visitors would brighten their day. Certainly knowing that their church family still thought of them and loved them would bring good cheer. And perhaps it did. But what I learned to expect after the first time I filled this role was that they weren’t the recipients that day. No, it was me. I was the one who left feeling better. I saw people in what seemed to be really difficult situations laughing, showing love and appreciation, and sharing wisdom. They were asking about me. Wasn’t I the one who was supposed to be doing that? Apparently they didn’t get the memo. Instead of taking, they doled out. Perhaps that is wisdom, something we all gain with age. Or maybe there was just something special about these folks. It seems that they have figured out that giving is better than receiving.